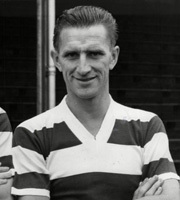 Johnny was a cultured Scottish footballer and a great favourite in the 1950s and 1960s. He stayed in the Reading area for over half a century and never lost his love of a wisecrack or his support for Rangers! In 2017 he was inducted into STAR’s Hall of Fame and we were really pleased to welcome him and his family that evening. He was a great Reading captain, full back and penalty taker and will be sadly missed.